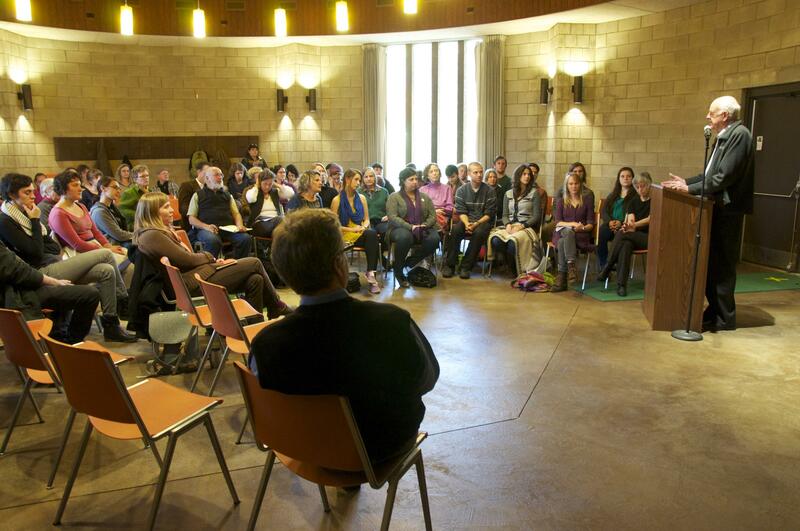 Author Wendell Berry speaks with Antioch College students the day after being awarded the Richard C. Holbrooke Distinguished Achievement Award at the Dayton Literary Peace Prize ceremony. Kentucky-based writer Wendell Berry was honored as the 2013 winner of the Richard C. Holbrooke Distinguished Achievement Award as part of the Dayton Literary Peace Prize at a ceremony last night at the Schuster Center. Other honorees included Adam Johnson in fiction for The Orphan Master's Son and Andrew Solomon in nonfiction for Far From the Tree. Berry was presented his award by last year's honoree, Tim O'Brien. WYSO will air a special presentation of speeches from the 2013 Dayton Literary Peace Prize, including Tim O'Brien's introduction of Wendell Berry, on New Year's Day at noon and 8pm. Author, essayist and poet Wendell Berry has been named winner of the Dayton Literary Peace Prize's lifetime achievement award. The award recognizes his steadfast promotion of the need for people to live in harmony with their environment. The 79-year-old Kentucky-based writer of works highlighting the benefits of a simpler life backs up his words with his actions. He speaks out against strip-mining and other development he says damages the land. Meanwhile, he keeps a garden, raises sheep and lives largely technology-free on a hilly farm. In this special presentation of the 2012 Dayton Literary Peace Prize award ceremony, you'll hear from authors who have been honored for advancing peace through literature including Adam Hochshild, Andrew Krivack and Tim O'Brien, recipient of the Richard C. Holbrooke Award for Distinguished Achievement.